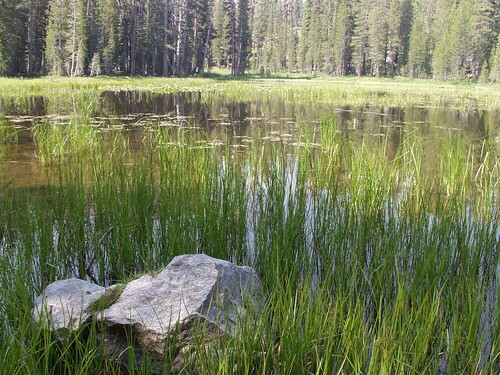 Most people stop at the small pond next to the Tioga Road without any thought about how it got there. It’s very scenic and a great spot to take photos almost any time of year. Not Garry Hayes, though. Garry sees it as a teaching tool to help students understand glaciation in the Sierra. Studying the effects and timing of glaciation in Yosemite National Park can be problematic, especially if you confine your studies to the floor of Yosemite Valley. The moraines are subtle, and some are missing because of postglacial erosion. The whole valley floor is covered by relatively thick forest, and ironically, it’s hard to find many exposures of solid rock to observe glacial polish, striations and grooves (they are there, but you have to know where to look). The valley is not even the right “shape” (like a ‘U’) because a post-glacial lake filled the valley floor with sediment. Mass wasting has greatly modified the valley walls. Other parts of the park offer some fine learning opportunities. Siesta Lake is a great place to see the evidence of three glacial stages with a few hundred yards of the road. As can be seen on the geologic map of the park (USGS Miscellaneous Investigations Series I-1874 by Huber, Bateman and Wahrhaftig, 1989), the lake is formed behind the moraines of a small glacier that came down the ridge at the headwaters of the South Fork of the Tuolumne River. The glacier was probably never more than a mile or two long, so the moraines from three different glacial stages are a short distance from each other. In the second photo above, the tills of two stages are in the same picture, with the younger Tioga deposits in the foreground (the angular bouldery deposits) and the older Tahoe deposits on the ridge. The Tahoe boulders are considerably more rounded and weathered. The Tioga stage lasted from around 20,000 to 13,000 years, while the older Tahoe stage took place somewhere between 65,000 and 160,000 years ago (kick the beehive and dozens of Pleistocene researchers will buzz about and start arguing about the specific dates).